In winter we are always looking for clothes that are both comfy and warm but chic at the same time. However not a lot of women wear long skirts in winter. And by long I mean super long: the ones that cover at least your ankle. Because despite beeing comfy and warm, they are pretty difficult to wear in a stylish way when it is cold. 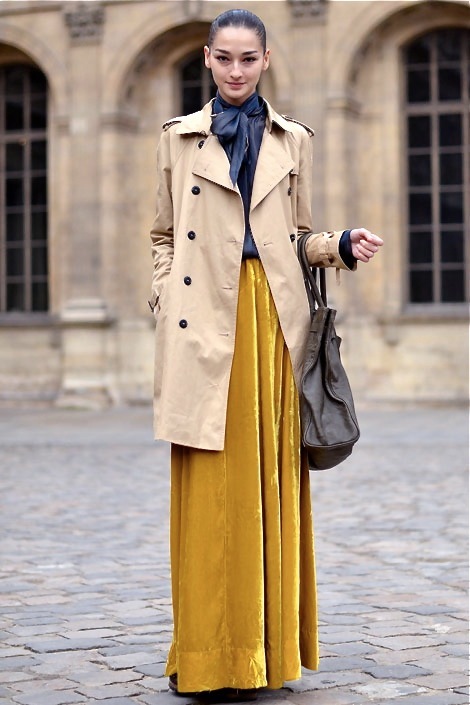 Here is how to too look amazing in a long skirt even if your name is not Esmeralda. The long skirt tends to make you look shorter than you are. If you choose a maxi skirt, it can also make you look heavier. So if you are aiming for something to make you look slender, you won’t find it with the long skirt. II. What kind of long skirt for me? The Esmeralda looking one we instantly think about when we say “long skirt”. It has volume and flows with the wind. Made of jersey or knit, it hugs your body but has some elastane in it so you can easily walk. This kind of skirt is easier to wear cause it does not shorten or enlarge the silhouette that much. And you can wear it in a 90’s minimalist chic spirit. If we are speaking long skirt, it shall cover the ankle and even the shoe but not clean the floor right? III. What to wear with my long skirt? Choose coats that are stiff and close to the body like tailored coats, trench coats or perfectos. A structured jacket is perfect for wearing your long skirt at the office in winter. If you wanna have allure, beware that your coat is not too long and too oversize, otherwise, you’ll look like this. Such as a square bag or a belt. The long skirt can look either dramatic, gypsy or rock…but you don’t want to look like you belong to a red carpet. So forget pumps and go for relaxed heels if you wanna lengthen your silhouette. Anyway, they will only be seen when you walk. The most important is that your heels are not too thin. Think seventies or nineties! If you are tall enough, flats will be perfect: knee boots, low boots or even sneakers. Here is why I don’t like long skirts with heels. And you? 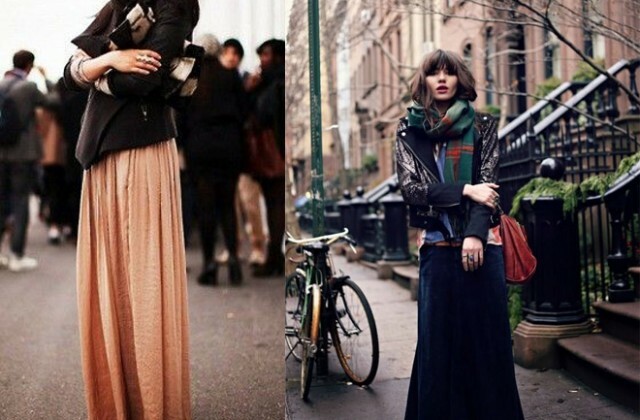 Do you wear long skirts in winter? This image is from your page. 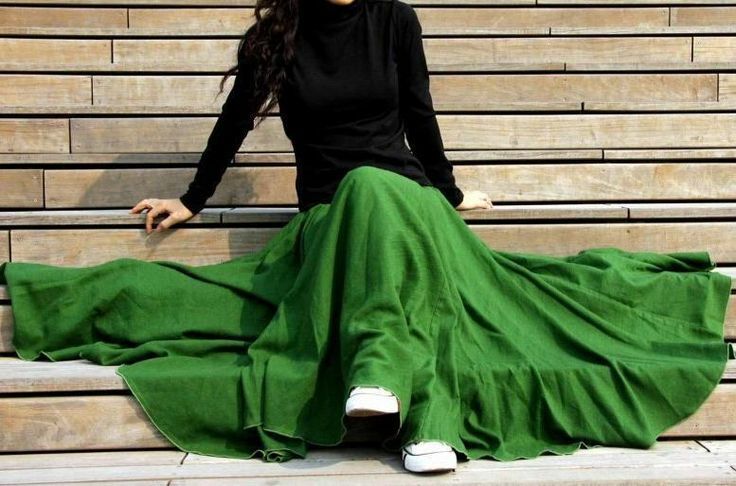 This skirt is exactly what I am looking for… or looking to make. Would you know what the fabric used for this grey pleated ankle long skirt is? And a good place to find a pattern? Also, do you think it is lined? Any help towards getting a hold of or making this skirt would be splendid!!! Thank you for your beautiful blog. Super inspiring! Thanks! I recommend you go to a good tailor and show him the pic, if he is competent he’ll be able to help. My guess would be some quality polyester pleated fabric (to hold the pleats). I love all of these ideas! We must be on the same wavelength because I just wrote about wearing maxi skirts in winter, too (http://www.franticbutfabulous.com/wear-maxi-skirt-winter/ if you’re interested). I very much like your advice on wearing a long knit skirt. Do you have a few examples that you like? Exactement que je cherchais! Merci! I wear long skirts all year long. Believe it or not actually wear short skirts more in the winter when I can cover my legs with tights. I am 51 and my legs have had alot of fun in life; they show it too so i don’t do the short bare leg thing anymore. I don’t wear the maxi skirts though – I wear ankle length or just above and I have some beautiful ones I always get compliments in. There are many nice things about being over 50, one of them is you can wear this length skirt and look sophisticated, not old fashioned. I would LOVE LOVE LOVE to see you do one post where you focus on middle age woman with awesome style; not frumpy but not looking silly either, and share your science as to what makes the difference. Hi Aloïs, I wear shorter skirts in winter too, as they look great with opaque or patterned tights and with boots or flats. In summer I wear longer skirts to cover up some spider veins that have started to appear. Very annoying as otherwise my legs are quite long and nice! I have also started to wear short tunic dresses in autumn and winter as they look good with leggings and capris and ballet flats or even strappy flat sandals. I would never wear such a short length now in summer with bare legs, although when I was younger I wore lots and lots of short skirts and dresses! I love it when young girls wear shorts with black tights in winter. I definitely see that as a younger look though for some reason. As I am 42 I would not wear that look. Seconding the request for a post on middle-age awesome style! I, too, love the winter months and wear skirts exclusively then because I can wear them with tights. I am short and more curvy than skinny, so I rarely wear skirts that are longer than an inch or so above my knees. However, I find that clingy thick knit black skirts, about mid-calf length, work on me in the winter because I can pair them with tights and knee-high black boots. I haven’t found consistent success with any one brand in that area, though. Pas encore mais cet article donne réellement envie de s’appropier ce style. J’adore la dernière photo : je n’aurais jamais cru que que des sneakers pouvait donner un tel résultat ( la robe verte est également sublime).